ACTIVITIES - Something for Everyone! Our Activities Liaison, Lois Gadol will contact you as soon as possible! Presently we have members playing Bridge, Bunco, Canasta, Hand & Foot, Mexican Train, Mah Jongg, Dominoes, Scrabble, Shanghai & Tripoley. You may decide to join a regular game that meets monthly or weekly or you can put your name on a substitute list to play only when you are available. Contact Lois Gadol for any game information. On the 3rd Tuesday of each month we have a luncheon held at a local restaurant. 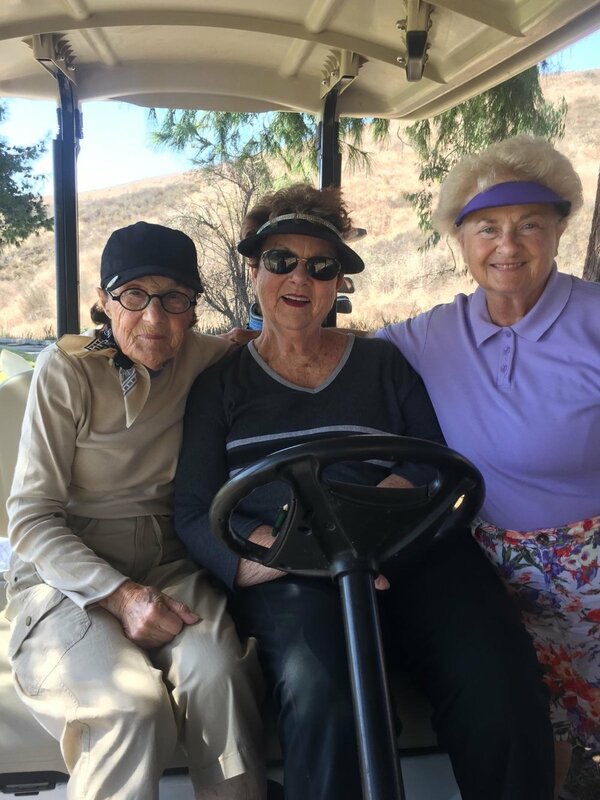 Some of the restaurants we have previously visited include Benihana, Hunter Steakhouse, El Camino Country Club, Oceanside Broiler, Cicciotti's, and Masters. Typically 30-70 people attend these fun events. Entertainment is arranged periodically. Past entertainers have been musicians, dancers, a Bingo event or game day. Details about the monthly luncheon can be found in the newsletter and are also announced at the Coffee/Business meeting. Our luncheon co-chairs are Carola Grove and Vicki DeFrancesco. After our Coffee/Business meeting on the 1st Tuesday of each month, many members continue to socialize at a local restaurant. The restaurant chosen has offered to help our group by returning 15-20% of our lunch receipts back to our club for our charity fund. Some of the restaurants who have generously helped us have included Rockafellas Famous Deli, BJ's, Masters Kitchen, Oceanside Broiler, Hunter Steakhouse, Applebee's and Bagby's. Pat Carson is our Dining to Donate co-chair. Our Couples Group at the 2017 Holiday Couples Party at Carlsbad by The Sea. If you have a spouse or significant other who likes to socialize with other couples we have monthly opportunities for you to get involved. Our couples group plans several Happy Hour events at local venues such as Oceanside Broiler, Vintana, The Landings or Dini's By the Sea. There is an additional $10 fee to become a member of the Couples Group. Barbara Herzog is the contact person for this social group. Single members enjoy monthly Sip & Savor parties held at the home of their members. The host provides her home and paper goods and their guests provides the delicious appetizers and desserts. Jeanne Gross is the contact for the Singles Group. Another option is the "Sunday Dinner Group" on the 2nd & 4th Sunday of each month. Single members meet at various restaurants for a night of good food and friendship. Ilene Moir is the contact for this activity. Enjoy good good, great conversation & wonderful friends! This group gathers at a local breakfast spot one day each month. Any Oceanside Newcomers & Friend member may attend. Dates and locations are listed in the monthly newsletter and are noted at the Coffee/Business meeting. Contact Barbara Keiley for more information about our Breakfast Bunch. The travel group visiting Liberty Station. On the 4th Tuesday at 1 pm each month, the travel group meets at a member's home to plan day trips for our members to attend. The meeting location of each meeting is announced in the newsletter and at our Coffee/Business meeting. Join in on the fun by contacting Jeanne Gross. The 3rd Thursday of each month at 12:30 pm is when a fun, intelligent and very friendly group gathers to test their knowledge and memory playing Team Trivia. The game is played in teams of 3-4 people and usually 12-18 people attend this fun trivia question game. Any member of Oceanside Newcomers & Friends is welcome to join this group and you need to contact Barbara McKenzie to get started. Some of our walkers at the Oceanside Harbor. Love to walk? Then the Street Walkers is the group for you! Members walk at a different scenic location each week and gather for the exercise and stimulating conversation. All walks are fairly level and this activity is weather permitting. Ellen Noble is the contact person for this activity. Locations of each week's walk are listed in our Members Only calendar on this website. 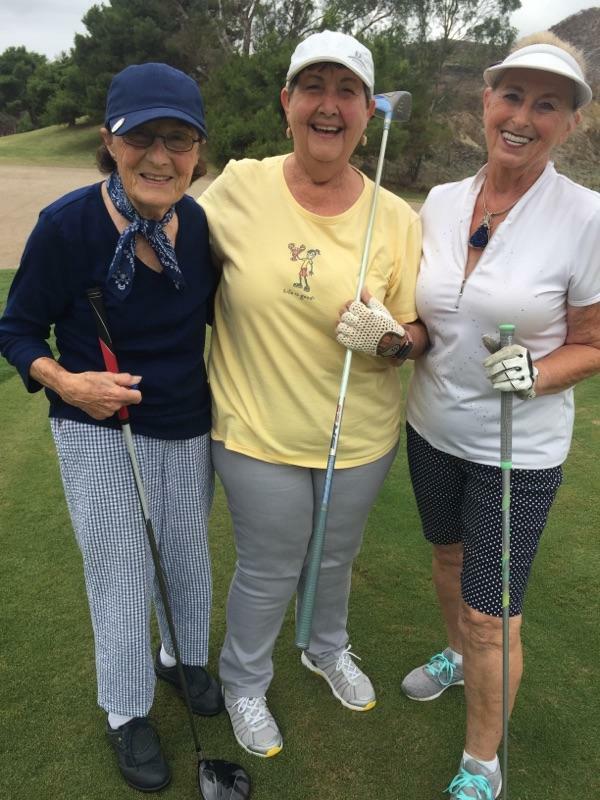 Our golf group meets every Wednesday at 11 am at the Oceanside Municipal Golf Course on Douglas Avenue. These women are even willing to teach you if you've never played golf before. Golf carts are used if walking is an issue for you. Marylyn Novak would love to hear from you if you need more information. Our Facebook page is a place to share, chat and enjoy group photos. It is also a way to receive updates on group activities and local events. Any member can join us! We have "secret" status for our group, meaning our group cannot be viewed by the public or members who are not signed in by the administrator. To join the group contact Ronna Bixby. Food and friendship make a wonderful combination. Enjoy a wonderfully prepared meal at a member's home where each guest brings a delicious dish to share. Jeanne Gross is the contact for this group. Oceanside Newcomers & Friends has two main avenues for building the charity fund. A charity basket is circulated at coffee meetings and a Dining to Donate event is held after monthly coffee meetings. We donate funds to one or two local charities each May. Past donations have been given to Hugs from Home, Last Chance at Life Animal Rescue, Canine Companions, Solutions for Change, Veteran's of North County, and Got Your Back. Have fun while helping our North County community. Our club cares deeply about all of our members. A monthly update is provided in our newsletter and at our Coffee/Business meeting regarding the health and loss of our members. We encourage members to send get well and sympathy cards. Dee Porter is our Helping Hand coordinator. At our Coffee/Business meeting as well as our monthly luncheons our members can purchase opportunity drawing tickets for a chance to win a cash prize in the random drawing. Half the money collected goes to the group's general fund to help us subsidize our Holiday Luncheon. Tickets are sold for $1 for one or $2 for three chances. Several items are collected at our monthly Coffee/Business meetings that can be shared with other members or recycled. Magazines are a great thing to share! Some of the items collected by members for recycle are: used greeting card fronts, new get well and sympathy cards, paper towel and toilet paper center tubes, old eyeglasses, hotel size soaps and shampoos and used cell phones. Many of these items are then distributed to local charities for their use. We donate to ARC, Brother Benno's, The Humane Society and Hugs from Home. See the Recycling section under the Updates page for more information. Our Membership Co-Chairs hold an orientation/meet-and-greet for new members each year. Meeting others, forging new friendships and acquainting new members with the club is our main goal for this event. Many new members decide to get further involved by joining our Standing Committee or Executive Board. Our Membership Co-Chairs are Joan Husen and Lou Edwards. If you need a ride to an Oceanside Newcomers & Friends meeting or event we sponsor. We have several drivers who have graciously volunteered to assist those members not able to drive. These volunteers are listed in our "Members Only Updates page" on this website.